Are you in the market for a bargain French ski property? The words "bargain" and "ski property" rarely sit easily together. At least, not when you're talking about the French ski resorts (The Best Ski Resorts in France for Buying a Property). But a combination of lower prices and the availability of property for renovation has changed the picture. While renovation has been almost done to death in many parts of rural France, it seems that property seekers haven't often considered the option of buying a ski chalet to renovate. With the benefits on offer, that's surprising. There are real bargains to be had! If total renovation seems a bit much to take on, you can buy a chalet that needs updating rather than a full rebuild. Most people who are looking for holiday property in the ski resorts want something that's ready to move into. So, they won't look twice at a chalet that's a bit dated and drab. These chalets can sit on the market for a long time with few people taking any interest. So, with a little vision and effort, you could buy such a property at well under the normal market price and make a handsome profit. Unless you've got a very generous amount of cash in the bank, the chances are if you've been looking at buying a ski chalet in the Alps or in any good ski resort in France, you'll have ruled out larger properties. We might dream of a gorgeous Savoyard farmhouse set in a pretty pocket of land, close to the slopes, but realistically, who can afford it? If that's what you've been thinking, think again! Buying to renovate means that you don't have to squeeze your dreams and your family into a tiny apartment. Buying a ski property to renovate is a great capital investment. Even during recent hard times for the French property market, well maintained properties in the Alps have held their prices and performed far better than in much of the country. So, it's worth spending a little to gain a lot. There's more than just capital gains to be had after renovating a ski chalet though. If you don't want to sell immediately, you could enjoy years of skiing or summer mountain holidays yourself. Or, you could rent it out to holiday makers and benefit from a really useful income, all the while watching your investment gain value. Makes you wonder why more people haven't cottoned on! It might be called a ski property, but don't forget that a property in the Alps is likely to be popular in any season. Many ski resorts double as summer resorts and offer a host of activities in all seasons. As spectacular as winter is, with the mountains under a glistening blanket of snow, spring, summer and autumn are equally gorgeous. They appeal to walkers, climbers, mountain bikers, white water enthusiasts and more. So, renovating a ski property enables you to enjoy a lot more than just skiing! If the idea of renovating a ski chalet has got your blood flowing, there's no better time than now to start looking. French Property Links (FPL) is an internet property portal with plenty to show you. It's easy to find the properties that need renovating too. Just go to the property pages for the department you like, then look for "Properties Needing Renovation" on the left hand side of the page. Click, and browse the photos. You can get more information on the ones that interest you by clicking the "Make Enquiry" button. Happy Browsing! Incidentally, ten of the best chalets currently on the market are listed below, so why not check them out? 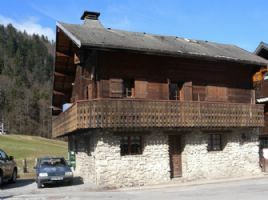 For sale - Village house - close to 3 Vallées. Close to Brides-les-Bains and Moutiers. 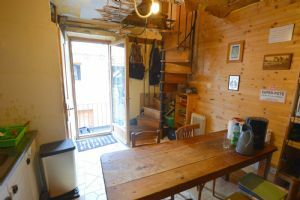 This delightful little house with balcony and cellar is located in a small village near to the 3 Vallées ski area. The property is East facing and and offers a habitable surface area of approximately 30m². There is a living room with kitchen and a separate WC on the ground floor and on the upper floor a double bedroom with shower room and balcony overlooking the valley. Some work is required on this property. A fabulous chance to own a remarkable mountain property. 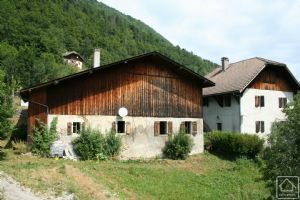 Set in a small hamlet of half a dozen buildings this delightful property faces East at an altitude of 1260m with awesome views out over the Megevette valley. Vitally it is connected to a drinkable’ water source and has a recent septic tank. Access would be by ski touring or snow shoes in the winter (a steady gradient walk for about 2km). In summer the road is tarmac most of the way to the hamlet. A lovely old farmhouse that needs some love and attention to turn it into a fabulous property! This is a full renovation project in an excellent location. An old savoyard farmhouse over-looking the Vallée Verte, above the village of Habère-Poche and just 300 metres from the ski slopes. According to its date stone the house was built 1668 which would make it one of the oldest buildings in the Vallee Verte. 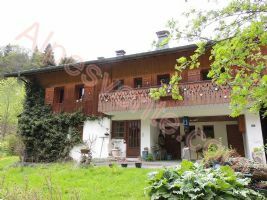 Charming character chalet, in the heart of the village, close to ski slopes, restaurants and shops. This property has been renovated in the 80s and comprises of three apartments, on four levels, enjoying the nearby alpine river which gives you a peaceful feeling! 4 bedroom, authentic farmhouse with huge potential. 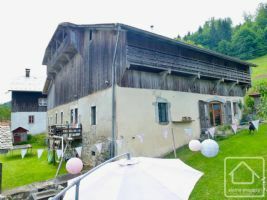 This magnificent farmhouse, dating back to 1848, is situated between the old bread oven and the small chapel of a charming, typically savoyard hamlet and just 12kms from the skiing at Les Carroz. The views are incredible, taking in the Samoens valley and surrounding mountain scenery. 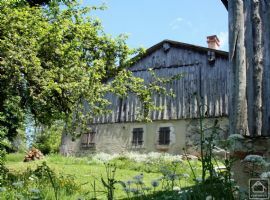 A large part of the farm has already been renovated but there is still great potential for lovers of original wooden structures and renovations. 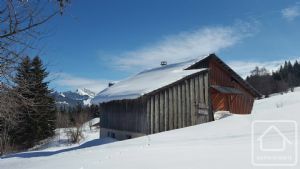 This south facing alpine chalet for sale is located in a dream setting on the mountain pastures of Saint Nicolas la Chapelle, just 15 minutes from Megeve and with easy access to Annecy, and airports in Chambery and Geneva. The traditionally built chalet is made up of 3 floors consisting of a large living room with fireplace, 3 en suite bedrooms, toilets, laundry room, wine cellar and double garage. There is also the possibility of adding an extension to the current property.